Artist interpretation of Kepler-30 and its planetary system. The planet Kepler-30c is shown passing in front of one of the large starspots that frequently appear on the surface of the star. Image credit: NASA. Kepler-30 is a distant star around which has been found a planetary system similar, in some respects, to our own. Kepler-30 lies about 10,000 light-years away and is roughly as bright and massive as the Sun. Observations by NASA's Kepler spacecraft have revealed the presence of three planets: one with about 4 times the diameter of Earth in a 29-day orbit, and two others each about 10 times the size of Earth in a 60-day and 143-day orbit, respectively. All three share the same orbital plane to within a few degrees. Not only that but their orbits are closely aligned with the rotational plane of the central star – as in the case of the planets in the solar system. This last fact could be established because Kepler observed a large spot on the star's surface in front of which all three planets pass. 1. Sanchis-Ojeda, Roberto et al. 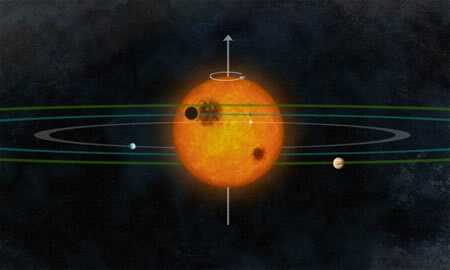 "Alignment of the stellar spin with the orbits of a three-planet system." Nature, 487, 449–453 (26 July 2012).